Dive Journal: Time for our final instruction dive #4! We meet Wyatt at the dock at 8:30a to do our navigation skills. Linda and I sit with our compasses for a while and notice that Linda's compass, borrowed from Myron and Mercedes, simply does not align with the one supplied by the island. Interesting. We assemble our equipment on the dock, then jump in and suit up off the edge of the dock. We begin the skill by selecting a distant buoy, agreeing on and setting a compass heading, then beginning our 25 fin-cycle swim out and back. Not surprisingly, Linda and I immediately diverge in two slightly differing vectors and pretty soon I cannot see her anymore. When I return to the boat, I am about 15' off my starting point, ending roughly at the prow of the Pelican. Linda's return has the same margin error but she ends at the stern. Since we have both ended up generally at the boat, however, Wyatt proclaims that we have marginally passed this skill. We both later decide that we should've peeked a bit more. We toss our gear onto the Pelican and get on board ourselves. Matthew and Monica are scheduled to do another resort course dive with us this morning, and so we wait until about 9:30a before learning that they have decided to cancel, so again it is just the 3 of us. We feel lucky to get such personal attention, unlike many cert dives held in North America. Wyatt motors out to our fourth and final dive site - Maddy's Cut or Maddy's Crevice. Wyatt explains that this site was discovered by Madeline Lomont, Becky's sister, several years ago. As we near the unmarked site, Wyatt trains his eyes across the bottom, looking for indicators that he is over the site. He eventually throws anchor, grabs a mask and fins, and jumps in to survey the area and find the cut. Meanwhile, Linda and I are to suit up on the boat and enter the water. The swells are moderate today, maybe 2-3feet. I help Linda on with her gear, and she completes a back roll into the water. I then suit up by myself, which I find not an easy task aboard the small boat tossing on the surface. Once in the water, I flick on the camera flash switch. I hope that it will work, since we have inadvertently left it on all night, but I don't worry too much about it since there are only 8 pictures left. We meet with Wyatt and make a free descent to a little sand hole that is barely big enough for the three of us. There is still a moderate level of surge and I wonder about how Linda's' stomach will hold out. The surge also makes keeping position inside the little hole a bit difficult. Almost as soon as we arrive, we all notice a very curious gray angelfish that starts swimming all around us investigating. We commence with today's skills, including a mid-water hovering skill, mask removal and replacement, etc. When I take my mask off, I see Wyatt pointing above my head, to my bewilderment. The angelfish is nibbling on my hair! Wish I had a picture of this event! We complete the skills with no problem, and Linda and I are glad to be finished with the mask removal skill. That salt water can really sting the old eyes. We begin an exceptional tour. We swim along the coral wall for about 10 minutes, and again we are simply awash with reverence for the beauty of these surroundings. We reach the cut, which instead of an open cut as on dive #2, it is enclosed. To enter the cut, we descend to about 75 feet. The cut is an 8 to 10 foot diameter tube-like opening in the corals, starting at 70 feet and rising to around 45 feet. 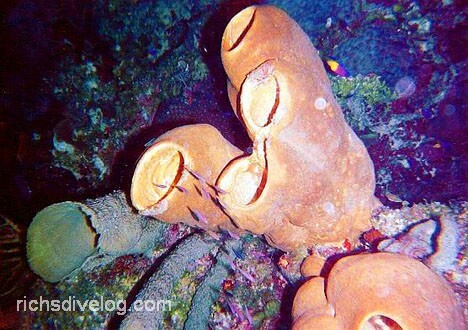 The shaft walls are crowded with brilliant corals and sponges, and a dazzling 360° display is afforded. Inside the tube, ten thousand tiny fishes hang out in refuge there, and rather than bolt at our arrival, they simply part as we swim slowly up through the conduit. GREAT! I take the remaining 8 pictures but detect no signs of a flash - I hope they come out OK anyway. As we swim back towards the boat, we stop to see a colossal barracuda hiding out underneath a ledge in the wall. Wyatt spends some time looking for a lobster for our dinner, but he doesn't find any in our remaining minutes. At our exit spot, there is a big grouper boldly hanging around. Our dive has been about 40 minutes, and although we all have air left, Wyatt knows that we are at our planned no-decompression limit of 70' and 40 minutes, and we begin our ascent. FABULOUS DIVE!